Thursday, September 1st, 2016 at 11:02am. 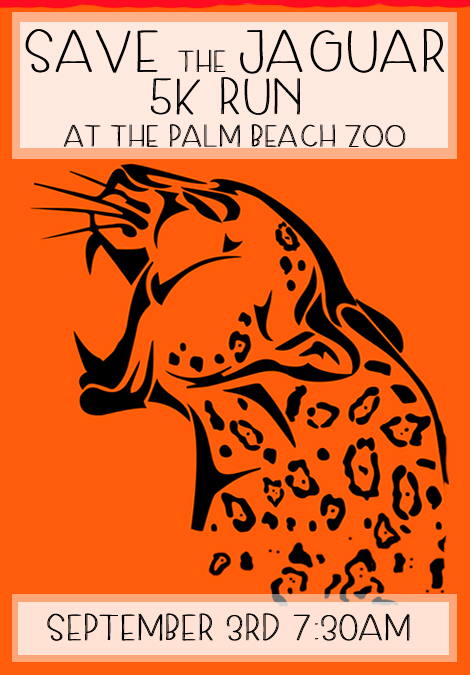 Happening this weekend at the Palm Beach Zoo in West Palm Beach is the “Save The Jaguar 5k Run.” The run kicks off bright and early at 7:30am on September 3rd with a run that winds throughout the zoo grounds. Participants will be running for a great cause, to save the Jaguar. “Years ago, jaguars could be found across the southern half of the United States. The expansion of human habitat and agriculture has long since forced them out of our environment. Now they're only found in South and Central America, and declining there.” The Palm Beach Zoo and its fans work incredibly hard to save these majestic cats. A portion of the race proceeds go to protecting these animals and their environments.